In the 2009-10 season, Zlobin skated for Spartak Moscow in Russia’s Minor Hockey League (MHL), playing in 51 games and scoring 50 goals. He also took part at the World Under-17 Championships as a member of Russian national team. He scored two goals and eight assists in six games, thereby catching the attention of North American scouts. In the 2010 Canadian Hockey League (CHL) Import Draft, Zlobin was selected by the Shawinigan Cataractes of the Quebec Minor Junior Hockey League (QMJHL). 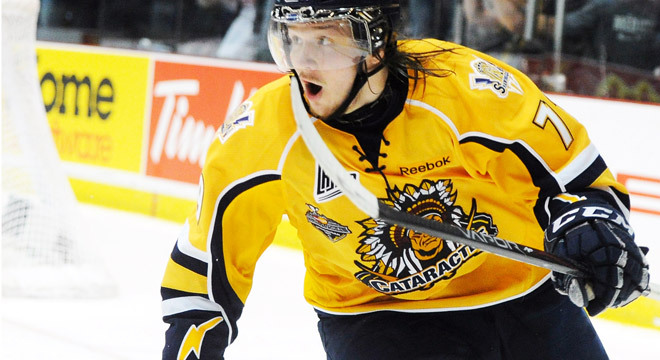 Zlobin finished the playoffs with five goals and one assist in 12 games with the Shawinigan Cataractes. Unfortunately, Anton was not selected in the 2011 NHL Draft. In the following season Shawinigan put all their hopes in Zlobin, believing that he would help them capture their first Memorial Cup in team history. Anton did not disappoint. Zlobin finished the tournament with five goals in six games and was ranked the best player of the championship. For his efforts, Anton Zlobin was ranked as the 137th best North American skater for the 2012 Draft by NHL Central Scouting. Shortly after that he joined the Pittsburgh Penguins. According to his coaches, Zlobin has been great with learning and wanting to learn, and his work ethic has totally changed since the beginning of training camp. Physically, Zlobin entered training in great shape; scouts concede that he has superb handwork, as well as great shot and offensive instinct. His best friend is Kirill Kabanov, a Russian player with the Shawinigan Cataractes. Kabanov's mother, Natalia, often prepares home cooked meals for the two friends. When Zlobin came to Canada, he was unable to speak either French or English, and it was who Kirill who hepled him to learn the language.